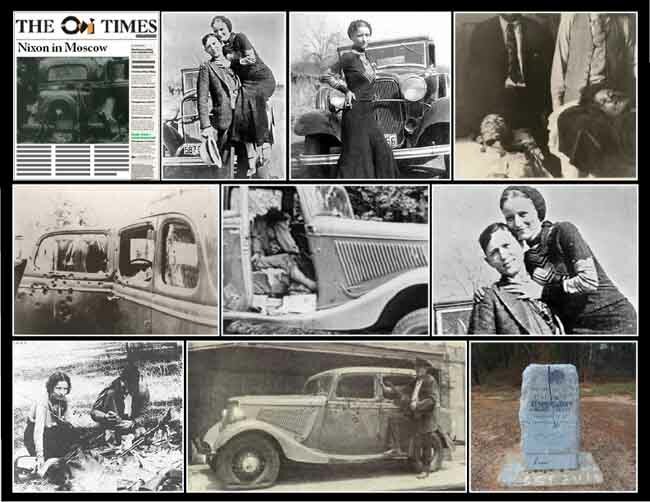 May 23rd 1934; famed fugitives Clyde Barrow and Bonnie Parker are killed in a police ambush near Sailes, Louisiana. A contingent of officers from Texas and Louisiana set up along the highway, waiting for Bonnie and Clyde to appear, and then unloaded a two-minute fusillade of 167 bullets at their car, killing the criminal couple. Today, Bonnie and Clyde have an unwarranted reputation as charming Robin Hoods, mostly due to the sympathetic personalities portrayed in the 1967 classic movie Bonnie and Clyde, starring Warren Beatty and Faye Dunaway.